John Quigley is the author of The International Diplomacy of Israel’s Founders: Deception at the United Nations in the Quest for Palestine (2016). 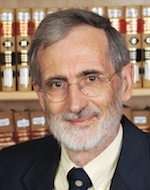 He is the President's Club Professor in Law at the Moritz College of Law at Ohio State University. After earning his AB, LLB and MA degrees at Harvard University, he was a research associate at Harvard Law School. He has written extensively on international law, in particular on the Arab-Israeli conflict. Photo: Jo McCulty/The Ohio State University.